This paper presents a cyclical system that generates autonomous fitness functions or Agents for evolving short melodies. A grammar is employed to create a corpus of melodies, each of which is composed of a number of segments. A population of Agents are evolved to give numerical judgements on the melodies based on the spacing of these segments. The fitness of an individual Agent is calculated in relation to its clustering of the melodies and how much this clustering correlates with the clustering of the entire Agent population. A preparatory run is used to evolve Agents using 30 melodies of known ‘clustering’. The full run uses these Agents as the initial population in evolving a new best Agent on a separate corpus of melodies of random distance measures. This evolved Agent is then used in combination with the original melody grammar to create a new melody which replaces one of those from the initial random corpus. This results in a complex adaptive system creating new melodies without any human input after initialisation. 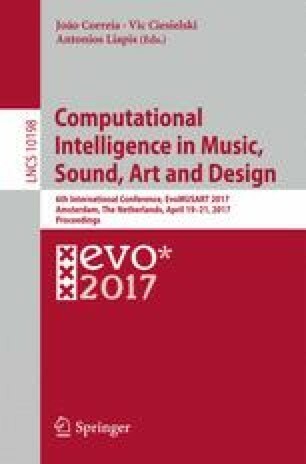 This paper describes the behaviour of each phase in the system and presents a number of melodies created by the system. This work is part of the App’Ed (Applications of Evolutionary Design) project funded by Science Foundation Ireland under grant 13/IA/1850. We would like to thank the anonymous reviewers for their suggestions on how to improve the paper.